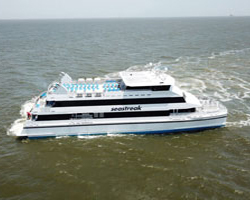 US operator Seastreak Ferries has taken delivery of a new 600-pax fast ferry, christened Seastreak Commodore, from Louisiana-based builder Gulf Craft. The aluminium vessel was designed by Incat Crowther, and is reportedly the eighth Incat-designed craft to join the Seastreak fleet, which provides passenger transportation services in New York, New Jersey and Massachusetts. Seastreak Commodore features an overall length of 45m (or 41.9m lwl), a breadth of 12m and a depth of 3.9m. The ferry has been designed to draw 1.63m, accommodate a six-man crew and carry 15,142litres of fuel oil and nearly 1,900litres of fresh water. Incat claims that the vessel is the “highest capacity” fast ferry to be built to the US Coast Guard’s K-Class for small passenger vessels carrying more than 150 passengers. The vessel is powered by four MTU 12V4000 M64 engines, designed to comply with Environmental Protection Agency (EPA) Tier III requirements, and rated 1,398kW at 1,800rpm apiece. These drive four Kamewa 56S4 waterjets and make possible a service speed of 35knots, increasing to 38knots max. In addition, Seastreak Commodore has been fitted with twin John Deere 6068 SFM85 generators. Other features include large side gates located forward and aft and an adjustable bow ramp, designed specifically to match the shore-based infrastructure on the ferry’s route. As well as undertaking New York passenger runs on weekdays, Seastreak Commodore will offer weekend sailings from the city to Nantucket and Martha’s Vineyard, both in Massachusetts.